a For seasonal trends in P/R see Figure 12.13 b Seasonal data show P/R < 0.5 throughout year instream primary production in this data set is notable and perhaps surprising. 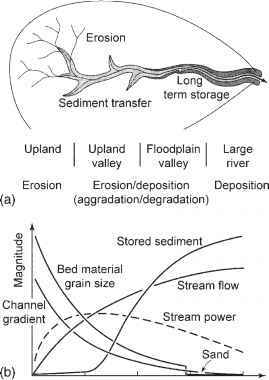 In accord with expectations of the greater importance of instream primary production as stream size increases, the P/R was positively correlated to stream order (Figure 12.14), and the correspondence was especially clear for river systems in Quebec and Oregon, which had multiple sites spanning a range of stream sizes. Note also that desert streams had high GPP and few litter inputs, reflecting their unshaded condition in unproductive landscapes; in contrast, blackwa-ter streams of the southeastern United States had lower P/R than expected from the overall data set and these are heavily shaded systems that receive high litterfall and floodplain inputs.